The results are in! Thanks to all of you who participated in our FertilAid for Women survey! The response was overwhelming… more than 800 customers shared their experience with us. The purpose of this self-reported, opt-in internet survey was to learn more about our customers… who you are, why you’re using FertilAid for Women, and how FertilAid for Women may have helped you in your trying to conceive efforts. After reviewing the results of the survey, we continue to be inspired by the role that FAW plays in so many TTC journeys, and are excited to share the results and comments with all of you! 3 out of 4 women surveyed believe that taking FertilAid had a positive impact on their fertility status. First things first… the results of the study revealed a few interesting facts about our customers. Three out of four survey participants were between the age of 26 and 40… this, we expected. We were surprised to learn, however, that more than 50% of survey participants had been trying to conceive for more than 12 months before ever taking FertilAid for Women. And, more than half of the survey participants had been diagnosed by a physician with a fertility-related condition, including endometriosis, PCOS, or unexplained infertility. What this means to us is that many women who take FertilAid for Women have already traveled a long way along the TTC road before they begin to take FertilAid for Women. 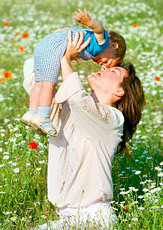 While we believe that FertilAid for Women can be beneficial in even the most difficult TTC cases, we also recommend using FertilAid for Women early on in your trying to conceive journey to help restore hormonal balance and provide the nutritional support you need, hopefully shortening the amount of time it takes you to conceive. Another surprising result we uncovered is that only about half of the survey participants took FertilAid for Women for 2 months or longer. We find it encouraging that so many women have successfully conceived and/or experienced improvements in the regularity of their cycle, even with such a short duration of use. Note, however, that it takes approximately three months to receive the full benefit of FertilAid for Women, as the body needs time to adjust to and fully assimilate all the vitamin and herbal components. For this reason, we recommend using the product for a minimum of three months or until successful conception occurs. Certainly, the numbers above paint a favorable picture of the benefits of FertilAid for Women all on their own. However, we enjoyed reading the comments that the survey participants submitted, and feel these inspiring comments tell a more complete story of the role that FertilAid for Women plays in the TTC experience. 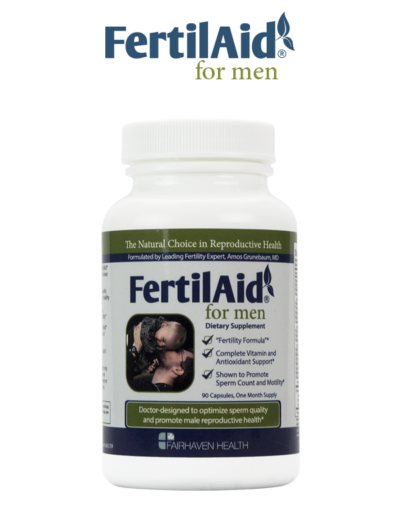 When I visited my fertility specialist she actually recommended I visit this site and get the FertilAid for Men… which I already had! Nice to know that I was on it before the experts told me to be. I already posted a review, but I was able to get pregnant twice while taking FertilAid. I have PCOS and one ended in miscarriage but we are trying again and I am ordering more FertilAid. I always refer people to try it and they usually get Pregnant 🙂 Thank you!!!! Used Fertilaid after 3 unsuccessful IUIs on Clomid. Found the Fertilaid and FertilCM significantly improved the quantity of my cervical mucus which I attribute to us being successful in acheiving pregnancy. Fertilaid made my dream of becoming a mother possible. Baby girl is due in June! I’ve noticed that while taking FertilAid my facial hair growth rate has decreased. I have more energy and overall feel better. I have lost 30 pounds since I started taking FertilAid with no change in my diet. I do my best to eat a balance diet. No pregnancy yet but I remain hopeful. I took FertileCM as well. It dramatically improved my CM. I started using fertiaid after diagnosis of infertility of unknown course, i tried your product for less than three months and conceived.I am now thirty weeks pregnant, due date march 24 2011, I recomented your product for many people that have problem of inferility.I AM VERY HAPPY , can’t wait to see my baby in next nine weeks.I am 38 years old. thanks to manufacturer of fertilaid. FertileAid seemed to even out my hormones during every part of my cycle back to what they had been previously a few years ago, but had slowly changed from. I was always told it would be very hard to have children because of how bad my endometriosis was, so as soon as we got married, my husband and I wanted to start trying. I began taking fertilaid the month prior to our wedding and I got pregnant while on our honeymoon! My husband and I tried to conceive for close to five years. I heard about FertilAid, and started taking it. Within six months, we were pregnant. I was very pleased with the results. I was only taking fertile aid for 45 days before I had a positive test!! I was not ovulating before I took it and within a bottle and a hlaf we were pregnant. I never even got a cycle!!! We are now 6 1/2 months along with our little boy and could not be happier! Thank you! 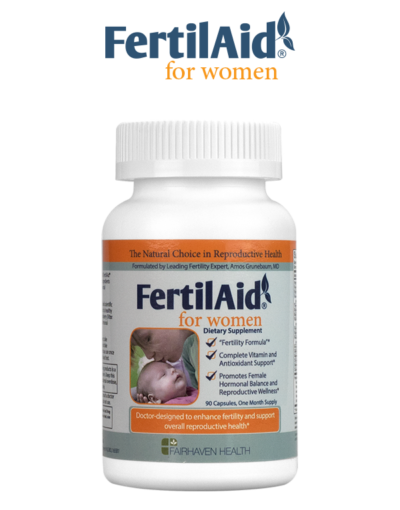 after starting fertilaid, i immediately experienced cramping and period-like symptoms. within 1 week, i started my period. (it had been over 60 days since my last period at that point.) once that cycle was over, i continued to take it, and did not get another period for 10 months… because I got PREGNANT!!!! After getting off birth control my periods were wildly irregular and I used fertiliaid to regulate it before starting TTC with a fertility specialist. This is another great use of the product. 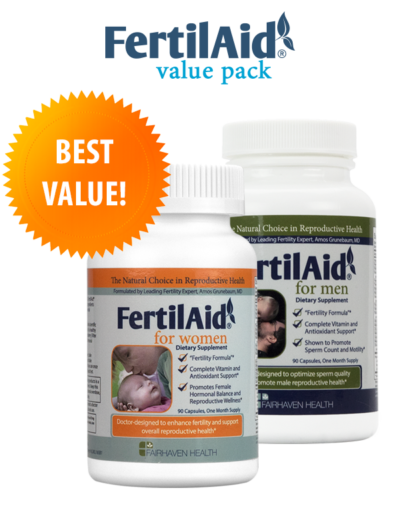 I showed the bottle of fertilaid to my Gynocologist and he said they were Prenatal Vitamins and that they were o.k. for me to take, After My Misscarriage and having a D&C I felt like my body was out of wack but when I started taking Fertilaid I felt better right away. I had Energy and felt like my hormones were trying to get back to were they needed to be. Good supplement for Women! I was skeptical but desperate. I had tried so many things, I figured it couldn’t hurt. I had 3 miscarriages and it had taken me awhile to get prenant in between. Then I tried fertile aid, the next month I was pregnant. Sadly I had a 4th miscarriage. However, after that miscarriage I kept taking fertile aid and got pregnant within two months. Now I am expecting a baby boy in April 2011! Before Fertilaid I had been trying to conceive for 19 months with no success. (I am 28 and my husband is 29) I had not even ovulated in a whole year! I started my Fertilaid regiment on February 19th 2010. I was taking the Fertilaid capsule along with Fertilaid CM, and Fertilaid tea. On March 22nd 2010, I had my first positive ovulation test. We welcomed a healthy 7lb, 8oz baby boy to our family on December 8th 2010. We know he would not be in our lives if it weren’t for Fertilaid! I took FertilAid for about six months to regulate my cycles before my husband and I started TTC. We started trying in September 2010, and I got pregnant that month. Our first baby is due in June. 1Survey results are not clinical study data and are not necessarily reflective of the broader population. 2Refers to survey participants that had been trying to conceive for less than a year when they started taking FertilAid for Women.